Location: Loftin Center at San Antonio College (SAC), 1300 San Pedro Ave.
Everything for Everyone and Nothing for Ourselves takes its title from the Zapatista slogan of mutual aid: “Para todos todo, para nosotros nada.” It reads left to right like an illustrated history book of Mexican-American activism and community leadership. The mural begins with the Olmec civilization, moves to the Aztecs and the story of conquest, depicts the Mexican revolution, honors leaders in the Chicano Movement, and finally pays tribute to contemporary leaders in San Antonio and beyond. The mural was sponsored by the Hispanic Heritage Committee and resides in the Loftin Center at San Antonio College (SAC). Dozens of volunteers including elementary school students, SAC students, and adult community members helped paint the mural, filling up a mural panel with names of all the volunteers. The mural begins with a painted corner showing the Mexican Flag and the San Anto Cultural Arts logo. 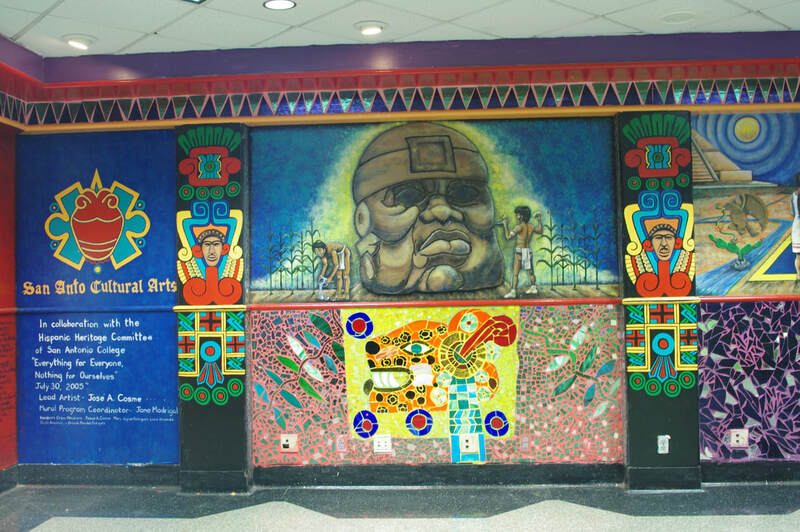 Text lists the names of everyone involved in producing the mural, the mural title, and the organizations responsible for the project (San Anto Cultural Arts, Hispanic Heritage Committee, and San Antonio College). The images on the columns between panels and the mosaics underneath the panels are all Aztec designs, mostly from the Aztec calendar. The first full panel shows a man working on a stone sculpture of a head, a tribute to the Olmec civilization. The head was cut from a piece of plywood, painted, and then installed on the mural. To the left of the sculpture another man is tending maiz, the staple crop of Mesoamerican civilizations. The second panel is split between day and night. In the day section, the sun shines over an Aztec temple. The temple stands behind the aguila en nopal, the sign Huitzilopochtli (sun god) sent to show the Aztecs where to build their capital city of Tenochtitlan (now Mexico City). In the night scene, a comet plummets towards a Spanish ship, a prophecy of what is about to happen to the Aztec Empire. The sun in the center represents the fifth sun, the final age of the Aztec calendar. In the foreground, La Malinche stands next to Spanish conquistador Hernan Cortez. They face Emperor Montezuma. Cosme painted Cortez in a suit of armor, hiding a revolver behind his back. Although a SAC history professor complained that a revolver in the 16th century is not historically accurate, Cosme explained that the gun was meant not to be factual, but to represent the Spanish betrayal of Montezuma and the Aztecs. The third panel depicts military and political struggles for freedom in Mexico, including the war for independence from Spain and the Mexican Revolution. It shows La Virgen de Guadalupe appearing to Juan Diego on the hill of Tepeyac. Bartolome de las Casas, a Dominican friar, stands next to them. Writer Sor Juana Ines de la Cruz sits with outstretched arms next to a cameo of Joaquin Murrieta and revolutionary ex-priest Miguel Hidalgo, with wild hair and a raised fist. A picture of the Catholic missions stands behind the three, representing the Catholicization. To their right is a portrait of President Benito Juarez, standing behind a group of armed fighters. The words next to Benito Juarez read: “El respeto al derecho ajeno es la paz,” respect for the alien’s rights is peace. 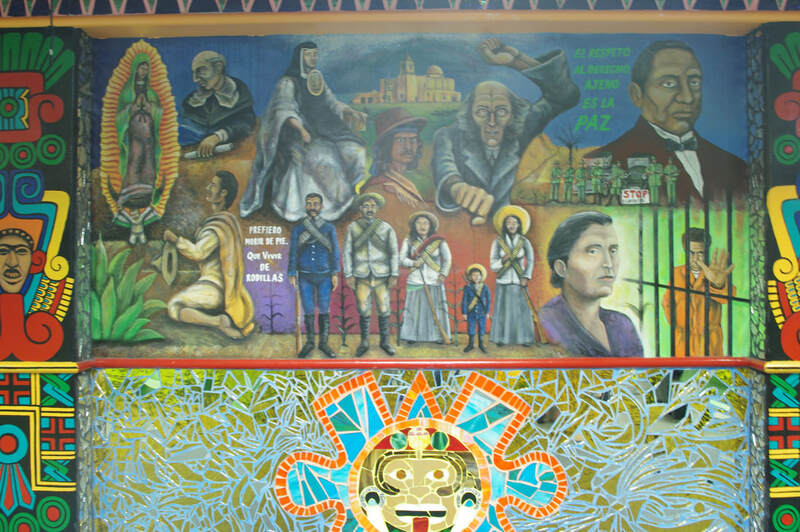 The bottom row of portraits features 1910 revolutionaries, including (from left to right) Emiliano Zapata, Pancho Villa, and Adelitas. Mexican-American rights activist Maria de Hernandez is next to them. Finally, Cosme painted legendary Mexican muralist David Alfaro Siqueiros behind bars. Although Clemente Orozco is now Cosme’s favorite of the “big three” Mexican muralists, he chose Siqueiros for this panel because of his militant, revolutionary bent. 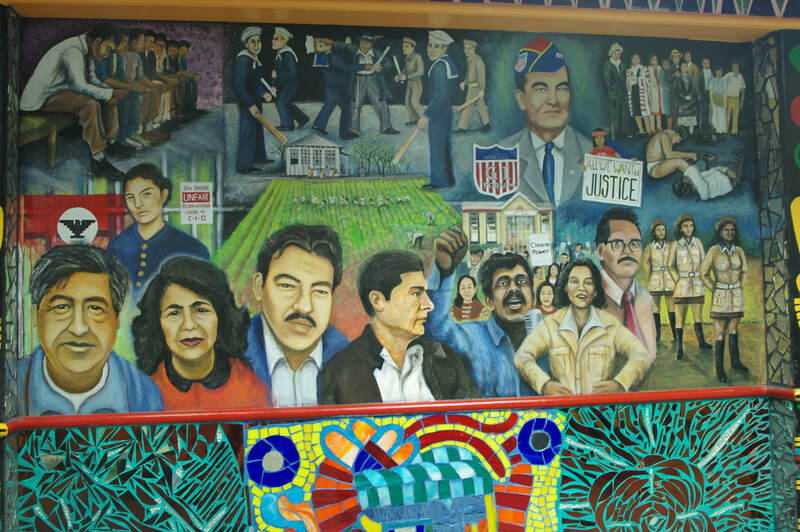 The fourth panel tells the story of Mexican-American activism during the Chicano movement. The top left image is of the Sleepy Lagoon murder, when seventeen Mexican-American men were arrested without evidence or bail for a single murder charge. Dr. Hector Perez stands between two scenes from the Zoot Suit riots. On the bottom row of images, Emma Tenayuca stands in front of the cell she was imprisoned in for her work with the pecan shellers’ union. Beneath Emma is a row of portraits: Cesar Chavez with the United Farm Workers Flag, Dolores Huerta, Willie Velasquez, Reies Tijerina, Corky Gonzales with his fist raised, Martha Cotera, and Jose Angel Gutierrez. They stand leading a crowd of protestors, with a file of female Brown Berets to the right. The center of the fifth and final panel is an Aztec sun with the pierced hands of Jesus extending from either side. Two calaveras dance beneath the sun, a reference to Dia de los Muertos. Cosme explains that everything in this mural “goes back to honoring the dead.” This panel features contemporary Mexican-American leaders, many of them native to San Antonio. The top left is Henry B. Gonzalez with Ram Ayala, the iconic owner of Taco Land, standing behind him in sunglasses. Next is Arturo Gutierrez, Cosme’s grandfather and role model. Next to the sun, wearing a suit, is Ruben Salazar. To the right of the sun is Marsha Gomez, artist and owner of the Alma de Mujer Center for Social Change. The grey figure in front of Marsha is one of her sculptures. Next is Adela Guiterrez, Cosme’s grandmother, and Selena. 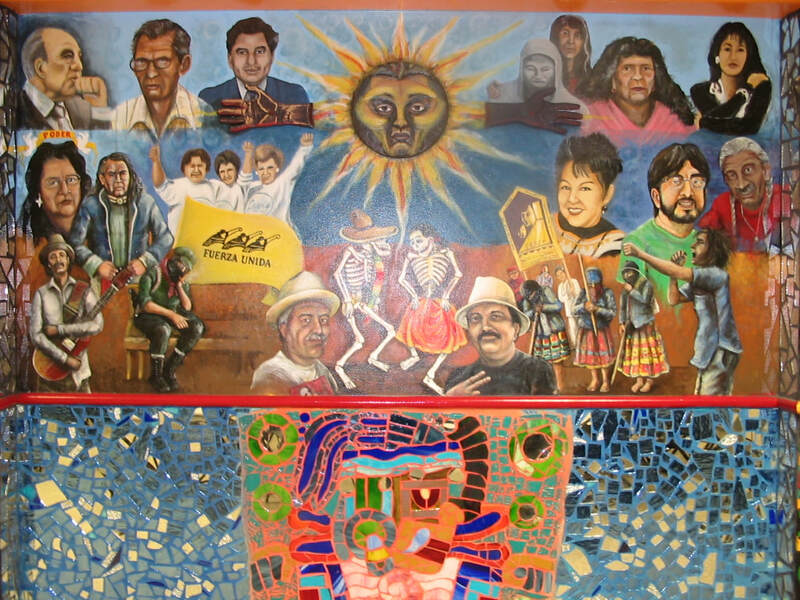 The bottom row of portraits shows activists Susana Almanza and Ramon Vasquez y Sanchez, and Levi’s workers-turned-activists organizing as Fuerza Unida. Subcomandante Marcos of the Zapatista movement in Chiapas sits on the bench in the mask next to Carlos Santana, who is playing guitar. Joe Lopez, owner of Gallista Gallery, stands to the left of the dancing calaveras and Chicano muralist Raul Valdez stands to the right. In the bottom right, Zack de la Rocha of Rage Against the Machine sings in front of a row of protesting Zapatistas. Above the Zapatistas are Patricia Castillo of the P.E.A.C.E. Initiative, Andy Benavides of the 1906 Gallery, and poet Raul Salinas. 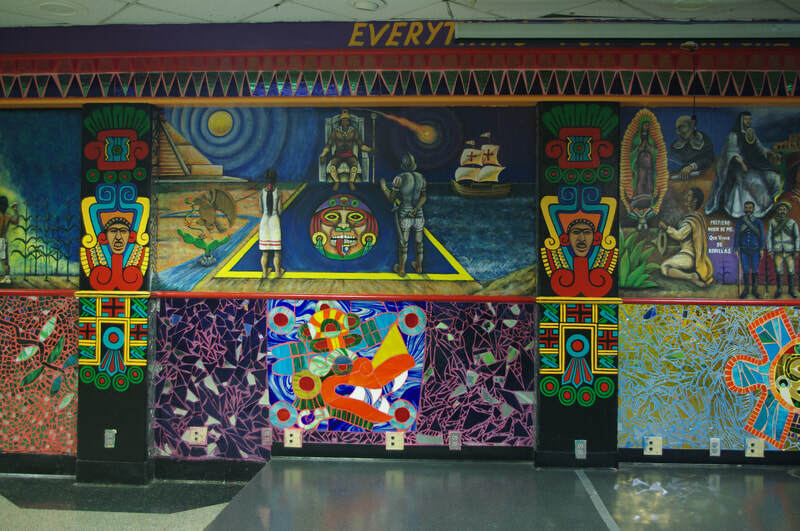 The mural concludes with a picture of Quetzalcoatl. Even though the brightly-colored serpiente emplumada is painted into a corner, Cosme made his image appear flat by using a projector to trace the picture onto the wall. This was the first major San Anto Cultural Arts mural painted outside the Westside. 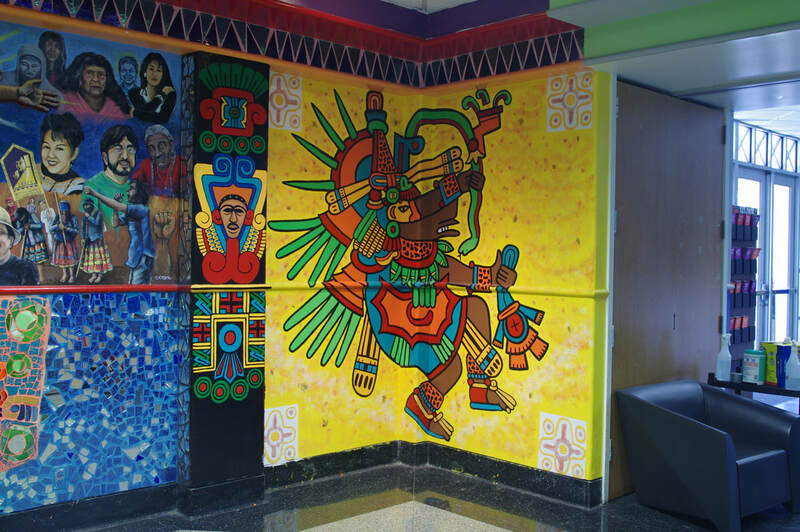 When The Hispanic Heritage Committee and San Antonio College (SAC) were seeking a muralist to paint a piece at SAC to commemorate Hispanic Heritage Month, Manny Castillo was initially hesitant about taking the project. Lead artist Jose Cosme recalls that “Manny liked to stay on the Westside because he wanted to serve the community.” Mural coordinator Jane Madrigal convinced Manny that the SAC piece would be an opportunity to build connections and raise awareness for San Anto. Cosme, who had been volunteering at San Anto for several years, accepted the position of lead muralist. Cosme met with Carmen Mendiola and Emma Mendiola (no relation) to understand the Hispanic Heritage Committee’s vision for the mural project and then brought several sketches to SAC president Robert Zeigler for approval. Because the mural is housed inside San Antonio College instead of outside in a neighborhood, San Anto Cultural Arts community process did not apply. Still, community volunteers painted the mural, including a cohort of students from Hawthorne Elementary School, SAC students, and adult volunteers. Cosme recalls how excited the elementary kids were to work on the mural. Some muralists are stressed by working with children and people with no painting experience, but Cosme’s philosophy was simple; “I just let them paint. I’m not freaking out.” Cosme and his crew projected and drew each panel onto the wall. He showed volunteers pictures of the mural design and then let the paint, blocking in colors on the wall. Cosme also worked with other artists to lead mosaic workshops, using the techniques he learned from former Muralist in Residence Anabel Rodriguez. This mural is meant to educate people about Mexican-American heritage. SAC created an audio tour of the mural to explain each panel, making the piece a picture book about San Antonio’s Mexican roots. Cosme remembers one volunteer who had recently arrived in San Antonio from a northern state. After attending a San Anto mural tour, she offered to help out with Everything for Everyone and Nothing for Ourselves. Although this volunteer had never eaten a taco before in her life, within months she had helped paint a mural about Mexican history and proudly wore a Mexican flag bandana in a group picture with the rest of the mural crew. I was talking earlier about struggles, trials, tribulations, being in the midst of that and not being able to see past it, it was the same for this mural. It was the first that I was in charge of and that can be overwhelming but you know, I never let it get to me. Working on it is fun, and so was getting it finished and being able to step back and appreciate it.